The investor saw the opportunity to scale Eric’s “secret strategy” – and he wanted to help fund a new venture to bring this brilliance to the financial masses! Both guys knew the power of dividend growth investing. But Eric’s second-level insight is what made them both a boatload of cash. He figured out a way to bet purely on the higher payouts – as close to a “sure thing” as you’ll ever see in stocks. Here’s what I mean. Problem is, traditionally there’s been no way to bet on the orange line above. You’d have to buy the index and hope its price (blue line) appreciates in tandem. 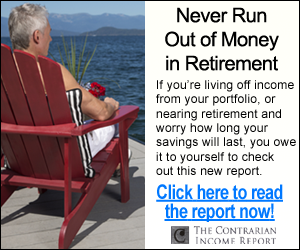 That might be OK if you have a multi-decade timeframe, but if you need your money in a few years then manic market plunges (like we saw in December) might derail your retirement hopes. Well, Eric figured out that he could buy “swaps” on S&P 500 dividend growth itself. This was an innovative way that he and his rich clients could bet on dividend growth only, without being exposed to price fluctuations. He eventually launched the Reality Shares DIVS ETF (DIVY) in 2014 to bring this strategy to individual investors (and was kind enough to walk through the specifics with me on the phone at the time). 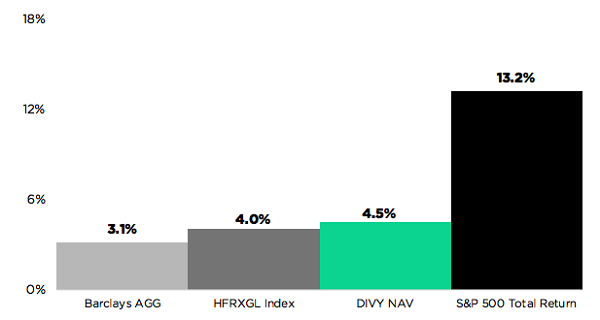 The genius of DIVY is that it capitalizes on the underappreciated annual tradition of dividend raises. For 43 of the last 46 years, S&P 500 companies have increased the total dividend payout. This results in steady gains that track payout growth rather than price action. So should we buy DIVY and call it a day? With S&P 500 growth projected to be 8% in 2019, it’s not a bad idea. But Eric has a newer fund that should provide us with even more upside. Since launching DIVY, Eric and his team created a five-tier rating system called DIVCON that provides a snapshot of dividend health for individual companies. It combines and weights seven factors (such as cash flow, earnings growth, and shareholder payouts) to provide a comprehensive snapshot of a company’s dividend health. DIVCON 5 is the best bucket. It means the dividend is in good shape, and there’s a 97.4% likelihood that it’ll be increased in the next year. DIVCON 1 is the danger zone. It means the dividend is more likely to be cut than increased in the next 12 months. By now you probably know that higher payouts drive stock prices up. But we can’t look in the rearview mirror to predict future dividend growth and stock returns. We need a leading indicator – like DIVCON. 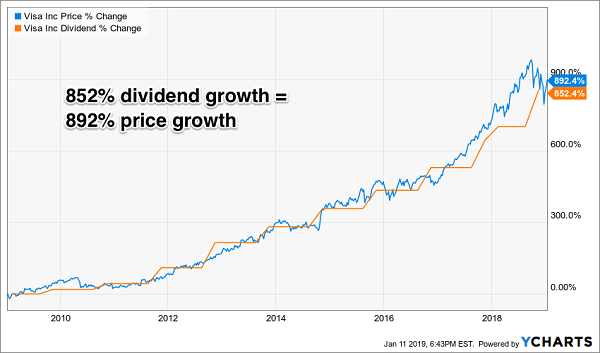 Everyone loves dividends, but dividend hikes are often underappreciated. Not only do they increase the yield on your initial capital, but they also reflected in a price increase for the stock. Let’s say a stock pays a 3% current yield and then hikes its payout by 10%. It’s unlikely that its stock price will stagnate for long. 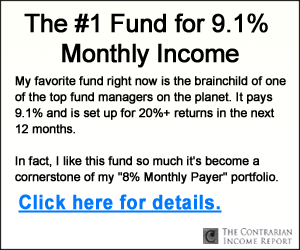 Investors will see the new 3.3% yield, and buy more shares. They’ll drive the price up, and the yield back down – eventually towards 3%. 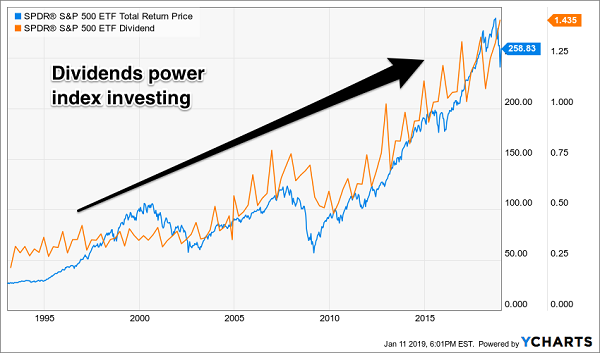 This is why your favorite dividend aristocrat never pays a high current yield – its stock price rises too fast! The LEAD ETF is a convenient way to get exposure to stocks that are “at-risk” of becoming the next Visa thanks to rapid share price appreciation. With DIVCON looking ahead, you can use this fund to create a diversified portfolio of the 61 blue chip stocks most likely to raise their dividends over the next 12 months. 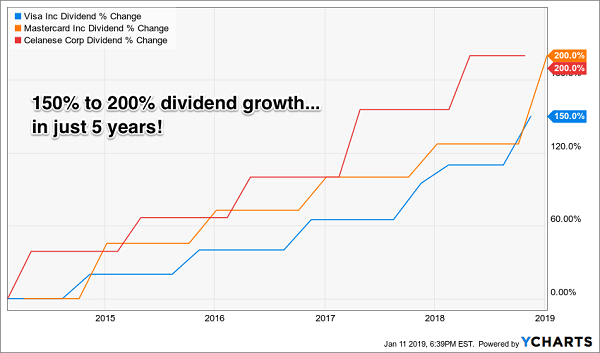 As Eric improved on the “dumb” yet effective dividend growth screen, we can further improve on his by cherry picking DIVCON’s best. After all, he has to own 61 names so that his ETF has enough liquidity – but we individual investors can buy only the very best! 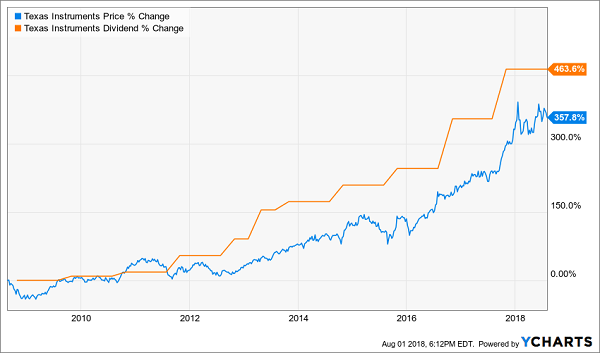 Texas Instruments (TXN) is a great example of an underappreciated stock we’ve profited from in my Hidden Yields research service (+16.7% yearly returns while we’ve owned it). Since dividends follow their share prices higher, we can make the most money by buying when these payouts are most likely to “snap higher” towards their runaway dividend curves. In other words, we buy the price dips when the dividend appears to be running away. Anyone who says you can’t time stocks hasn’t used this surefire strategy for buying shares ready to “catch up” to their runaway payouts. Buy any big lags you see. And thanks to the Q4 pullback in stocks, we have plenty of great snapback candidates. I’ll share my favorite pick with my Hidden Yields subscribers this Friday. Its next dividend hike is likely to be huge, and will place the stock in serious “snap back” territory. Which means the best time to buy it is today, before Wall Street wakes up. I’ll be emailing my full analysis to my Hidden Yields subscribers this Friday – click here if you’d like to sign up to receive it.